This week’s subject is a rather interesting large shrub that blooms in late winter or very early spring. In our nursery they often bloom in mid February! Depending on the variety, they bloom with unique yellow, gold, orange or red flowers. As fall approaches, the dark green leaves turn yellow with hints of purple and red. 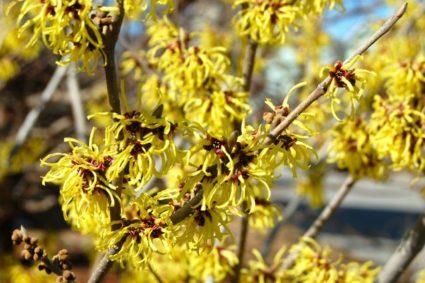 Witch Hazels make outstanding landscape plants that grow in the sun or even part shade, and once established require little care to keep it healthy and beautiful – just give it plenty of room. Witch Hazels produce a delightful spicy scent and birds will love snacking on the seed. Although not really hazels they are probably called ‘hazel’ because of the leaf shape, which resembles that of true hazels and ‘witch’ comes from the use of its branches as divining rods! A leaf and bark extract of the Witch Hazel is used for its astringent and soothing properties. They are very easy to grow, and I think they should be more widely used in our Kootenay landscape.